You have to use different browser for surfing on the Internet. Sometime you accidentally closed the active tab or recent web browser. At that time you need to again re-open or restore recently closed tabs in browser but you have forgot the URL of active webpage. There is no need to worry you can easily restore recently closed tabs in browser. There are few popular web browser like Google Chrome, Internet Explorer, Firefox, Opera. If you are working on these web browser and accidentally closed the active tab then you can get back closed tab without any extra effort. All we know it is not to easy to remember the complete URL of active webpage. You have two ways either remember the URL of recently closed tabs and again open the tab manually or, you have to use give simple tricks to restore recently closed tabs in browser. Most of the person like to open more than one related tabs in his web browser. During navigation in the browser window or doing other activity your recently tabs are closed. You must have to take few given simple steps if, you want to restore recently closed tabs in browser window. If you are running Google Chrome web browser and want to restore recently closed tabs then you have to take given steps. Step 1: Open Google Chrome browser on your system. Step 2: Press right mouse button on the tab bar and and click on the “Reopen closed tab” option. You can also press Ctrl+Shift+T shortcut key to directly open the recently closed tabs in Google Chrome browser window. If you want to reopen last week visited webpage on your system but don’t know the URL then you have to check the history of your Google Chrome window. Step 1: To open the history window of Google Chrome click on the settings or three vertical dots in upper right corner of Chrome window. Step 2: Click on the “History > History” option or you can also press Ctrl+H shortcut window to directly open history window on Google Chrome. Now you can simple click on any link which you want to open on your system. Most of the person like to work on Firefox web browser on his system. If you want to restore recently closed tabs in browser then you have to take few simple steps. Step 1: Open Firefox web browser on your system. Step 2: Press right mouse button the tab bar and choose “Undo close tab” option. You can also press Ctrl+Shift+T shortcut key to immediately restore recently closed tab in browser. If you want to reopen any required tab which you closed on yesterday or in back day then you just have to take few simple steps to restore them. Step 1: Open the history window of your Firefox web browser then click on the three horizontal bars which is located on top right corner. Step 2: Click on the “History” option and choose any required webpage which you want to open. You can easily view or check Today, Yesterday or Last 7 days browsing information in Firefox web browser. If you want to immediately restore all previously opened tabs the click on the “Restore previous session” option which is found in the “History” menu. If you have Opera web browser and want to restore recently closed tabs in browser then you just have to take given simple steps. Step 1: Open the Opera web browser on your system. Step 2: Press right mouse button on the Opera tab bar and click on the “Reopen last closed tab” option. You can also press Ctrl+Shift+T shortcut key. You can also click on the Tab menu which is placed on the top right corner of Opera window and click on the “Recently closed” option. If you want to reopen all those webpage which you viewed on today, yesterday or in back days. You must have to click on the Opera menu button and click on the “History” option. You can also press Ctrl+H to open the history window. Now, you can click on any required webpage which you want to open. Internet Explorer is one of the most and popular browsing software which is used by different users. 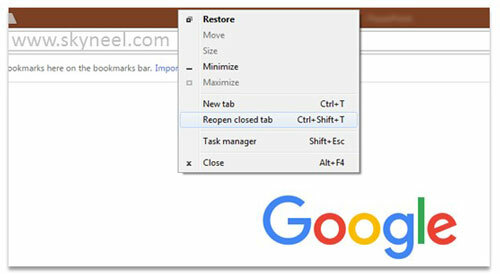 If you want to reopen or restore recently closed tabs in browser window then click on the “Reopen closed tab” option or press Ctrl+Shift+T shorcut key. If you want to reopen all recently closed tabs in Internet Explorer window then you have to right click on any tab and click on the “Recently closed tabs” option and click on the webpage which you want to open. To open all closed tabs in current session then click on the “Open all closed tabs” option. You can also check “History” option to view all previous webpage pages. After reading this guide you can easily understand how to restore recently closed tabs in browser. This guide relay helpful for all those guys who accidentally closed his recently tabs of webpages or want to view past days history of webpages. If you have any suggestion regarding this guide please write us in the comment box. Thanks to all.